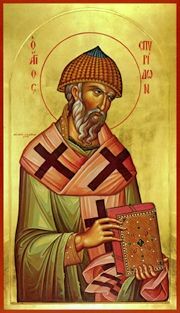 Notre père parmi les saints Spyridon de Trimythonte le Thaumaturge (gr. Σπυρίδων, cca. 270-348) est un évêque orthodoxe du 4e siècle. Il a participé eu Premier Concile Oecuménique de Nicée (325) an tant qu'évêque de Trimythonte (au Nord de Larnaka), dans l'île de Chypre. Ses reliques se trouvent dans l'île de Corfou, où il est vénéré comme "protecteur de la cité" (gr. ο πολιούχος). Il est commémoré par l'Église Orthodoxe le 12 décembre. D'après la tradition, Spyridon fut paysan et fermier, et ne reçu aucune éducation. Il fut marié et eut une fille, Irène. Après la mort de sa femme, lui et sa fille entrèrent dans le monachisme. Plus tard, il est devenu évêque de Trimythonte, ou probablement chorévêque (pendant le règne de Constantine le Grand) et fut très connu pour sa piété. During the Maximilian persecutions (295 AD) he was arrested and exiled. In 325 AD, he was present at the First Ecumenical Council of Nicea where he astonished many with his simple explanations of the Orthodox Faith. Though not well-educated, he surprised everyone at the Council of Nicea by converting a famous philosopher to Orthodoxy from Arianism. He explained the unity and diversity of the Trinity by holding up a brick, then commonly thought to be a combination of the elements fire, earth and water; as he spoke, fire blazed from the top of the brick while water gushed out underneath. There too, at Nicea, he met St. Nicholas of Myra, with whom he formed a lasting friendship. Through simplicity and deep devotion to God, he worked miracles throughout his life and became known as a great wonder-worker, calling forth rain in the midst of drought, casting out demons with a single word, healing the sick and even raising people from the dead, in addition to having the gift of prescience. When he arrived back home from Nicea a woman told him that she had given his daughter, who had died while he was away, some jewelry for safekeeping. Now that his daughter was dead, no one could find where she had put them. Spyridon went to his daughter's grave, spoke to her, and was able to restore the jewelry to its owner. Also during a famine Spyridon changed a snake into gold pieces so that a poor man could buy food from a greedy merchant who had cornered the supply. One day there was only himself and the deacon and readers in church at vespers, and the responses could be heard beautifully chanted by an unseen choir. The music was so beautiful that others, passing by, heard it and saw through the windows what seemed like a large congregation. Entering the church, however, they found only St. Spyridon and his assistants. St. Spyridon lived most of his earthly life in Cyprus, where he also reposed in 348 AD and was buried in the Church of the Holy Apostles in Trimythous. When the Saracens took the island, the Cypriots opened his grave in order to remove his sacred bones to Constantinople. They found that his body had remained intact, while from the grave emanated a scent of basil, true signs of the sainthood he had shown during his lifetime. When Constantinople fell in 1453, he was transferred to Serbia, then a Corfiot elder, Georgios Kalohairetis, brought him to the island of Corfu in Greece where he is currently buried. 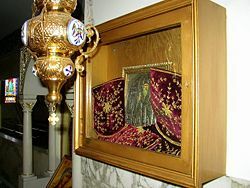 To this day St. Spyridon's incorrupt relics at his shrine in Corfu continue to manifest the power of God, wondrous in His saints. He is called the "walking saint" because the silk slippers which clothe the feet of his relics wear out each year and are replaced on his feast day. His miracle in Corfu against the Turkish invasion of 1716 is commemorated on August 11. The Tolstoy family story - The Tolstoy family, have also adopted St. Spyridon as their patron saint. In the 15th century, Andrei Tolstoy chose the saint as the family's patron and he remains so in both branched to this day. There are stories that say, that the Grand Prince of Muscovy Basil II(1425-1462) gave a gold cross to Andrei, with relics of the saint inside. This apparantly survives and is owned by Count Nikolai Tolstoy, the most senior member of the Tolstoy family. (en) Life of St. Spiridon], ed. Alan Mack, (c) 1995. La dernière modification de cette page a été faite le 22 novembre 2008 à 20:17. Cette page a été consultée 4 611 fois.